You may wish to read an introduction to this section or a page on the Roman period of the town first. Ancona is not a pleasing city to the eye, nor indeed to the nose, nor the ear. (..) No! Ancona is not a pleasant city in its outward physiognomy. (..) There is one thing however to be seen at Ancona, which it must be admitted is alone worth a visit to the city, including the trouble of getting out of it again. It is the Cathedral - not so much for the sake of the building itself, though it is not without points of interest, as for the magnificence and grandeur of its site. It is unquestionably, as far as my experience goes, the most finely situated church in Europe. In the Vth century a church was built on the site of a temple to Venus and it had the rectangular shape of a Roman basilica with three naves. Major changes were made in the XIth/XIIth centuries when it was greatly enlarged and given its current Greek cross shape. At that time it was a church dedicated to St. Lawrence and the Cathedral was dedicated to St. Stephen. 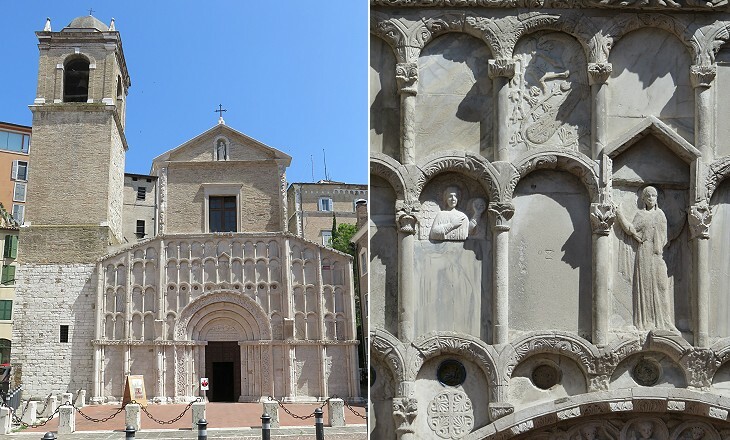 Eventually the church became the Cathedral and it was dedicated to St. Cyriacus who became the patron saint of Ancona and whose body is kept in the crypt of the building. It is unclear who St. Cyriacus actually was, but according to tradition he was a Bishop of Jerusalem who helped Empress Helena in finding the True Cross. The portal and the small porch preceding it are attributed to Giorgio da Como and dated 1228. 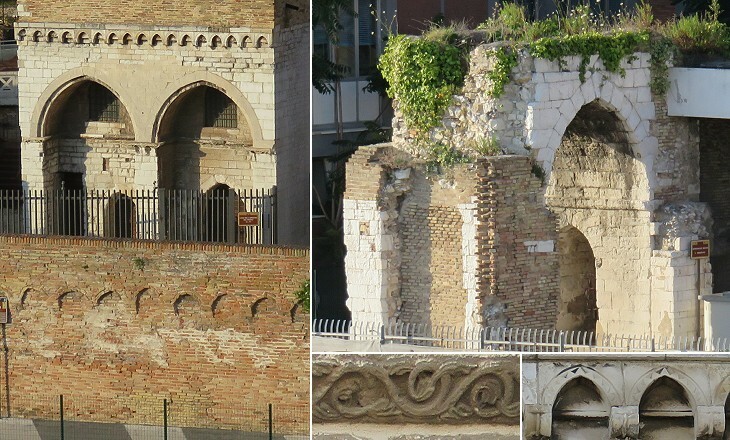 He employed a reddish stone from Verona to highlight some details. 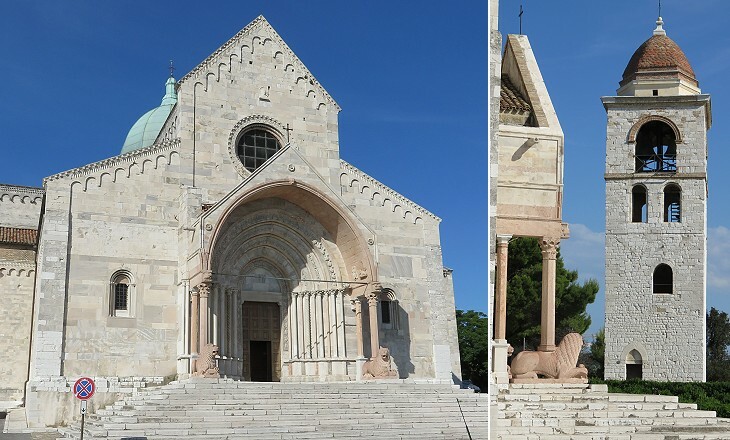 This contrast can be observed in many churches of Umbria which were built at approximately the same time (e.g. at Assisi) where a local pink stone was used. The Marches had many contacts with Umbria and the border between the two regions was never clearly fixed. 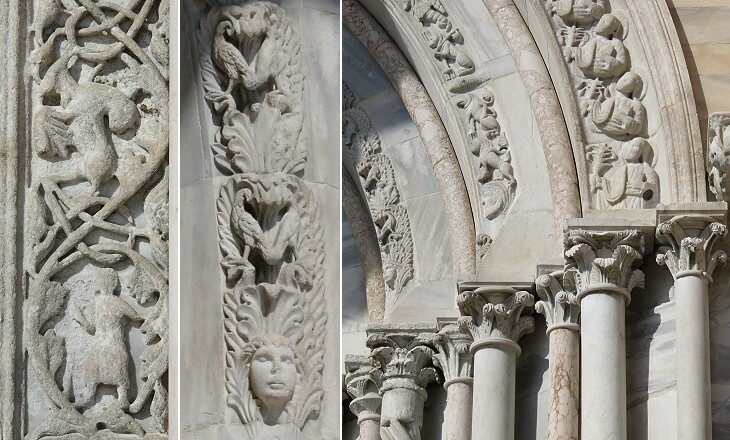 The embellishments to the Cathedral are a sign of the wealth of Ancona. The development of its economy however was regarded with hostility by Venice and in XIIIth century the two maritime republics were at war twice. In 1281 eventually Ancona had to accept major limits on its trade with the Levant, but it continued to look for opportunities to circumvent them, by seeking alliances with Pisa and Genoa, Venice's main rivals. The dome was built at approximately the same time as the portal. Because of the location of S. Ciriaco at the top of a hill it became the very symbol of Ancona, which its seamen could see from a very great distance. It was covered with copper in the XVIth century. The building shows clear evidence of the efforts made to restore and strengthen it after it had been damaged by WWII bombing and a major earthquake in 1972 (e.g. the drum supporting the dome). Some monuments in the interior of the Cathedral are covered in other pages. 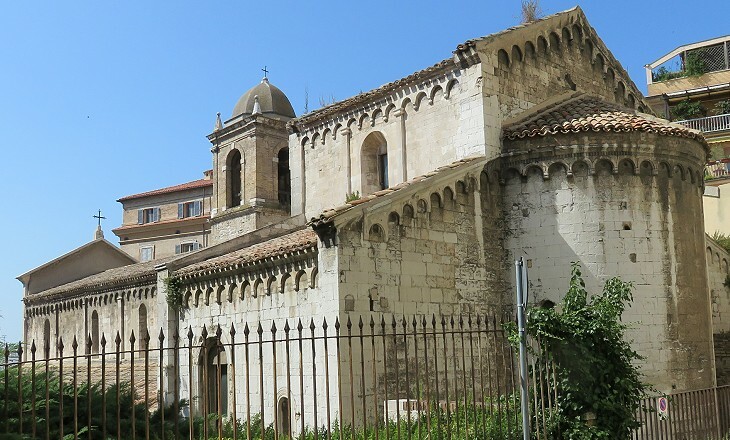 It is possible that this church near the harbour was the Cathedral of Ancona before S. Ciriaco. It was built in the XIIIth century on the site of previous churches. The rear part including the main altar and the choir is situated at a much higher level than the nave, something which can be observed in other early churches of the Marches. 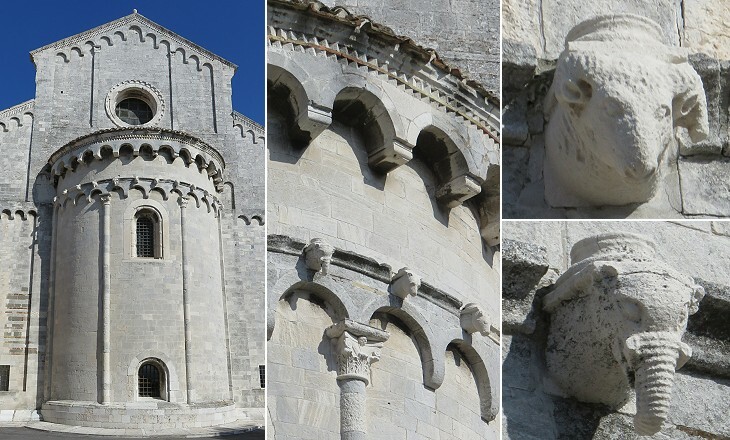 The façade was designed in 1210-25 by a stonemason known as Filippo Lombardo who came from the same region of Italy as Guido da Como. He employed pietra d'Istria, a white stone quarried in Istria and Dalmatia, which had been utilised since Roman times (e.g. the ancient walls of Spalato). 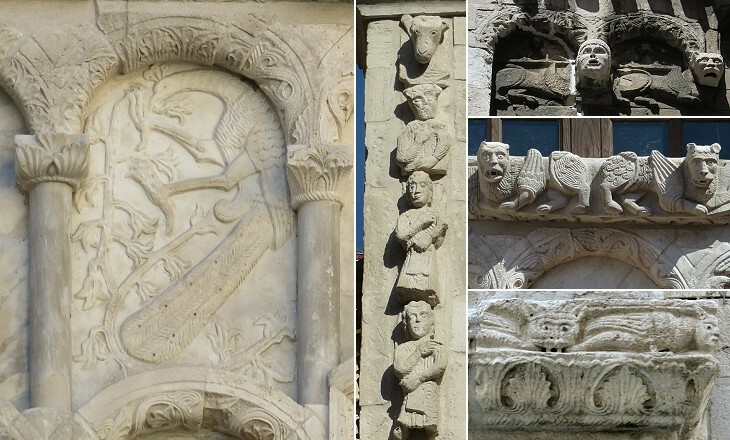 At Ancona it was extensively used to face or decorate brick buildings. The relief portraying a peacock, a typical subject of the decoration of early churches, came from the previous building, but by and large all the others were made by Filippo Lombardo and his assistants. 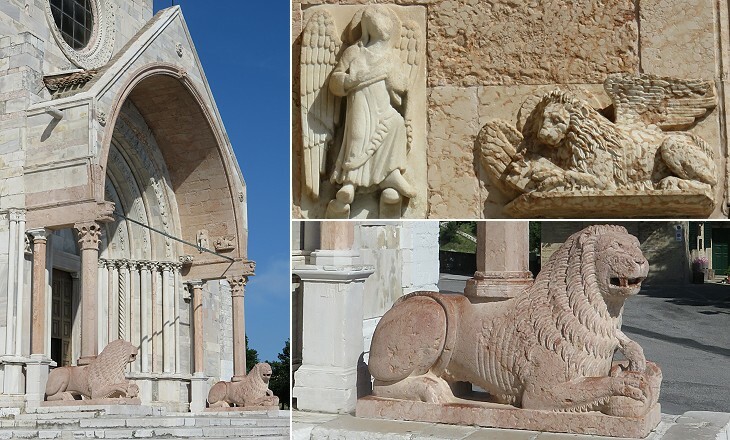 The presence of winged lions and other fantastic animals is typical of Romanesque sculpture (e.g. the churches of Tuscania). It is interesting to compare the work of Filippo Lombardo with that of Guido da Como at S. Ciriaco. The latter places his reliefs in an orderly manner which is consistent with the architectural design. The former is more a sculptor than an architect and he seems not to have space enough to place all the subjects he has in mind. Some of them are pretty amazing and they depict scenes we no longer understand, such as the upside down naked man with shoes who spreads his arms and legs wide. 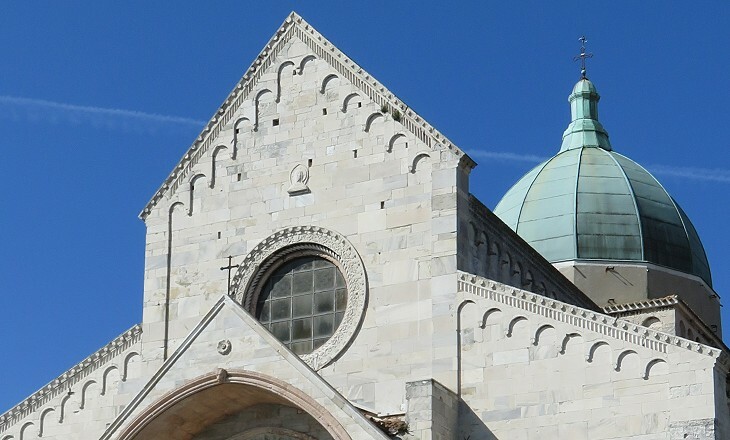 From a legal viewpoint Ancona was a possession of the Popes dating from the VIIIth century, but the town developed its own government structures, and the Popes had a sort of benign neglect towards them. In 1348, during the Black Death pestilence, the Malatesta of Rimini occupied Ancona and held it for some years until they were ousted by Cardinal Albornoz who imposed papal rule on the town. In 1383 however the inhabitants of Ancona rebelled and reinstated their republican government. The Senators of Ancona, members of the wealthiest families, held their meetings in a palace built in the upper part of the town. This palace was built in 1270 to serve as Town Hall. It is situated at a point where the slope of the hill is very steep, so that its side towards the sea has five stories more than the other one where the entrance is located. It was damaged by a fire when the Malatesta occupied Ancona and eventually it was utilised for other purposes. 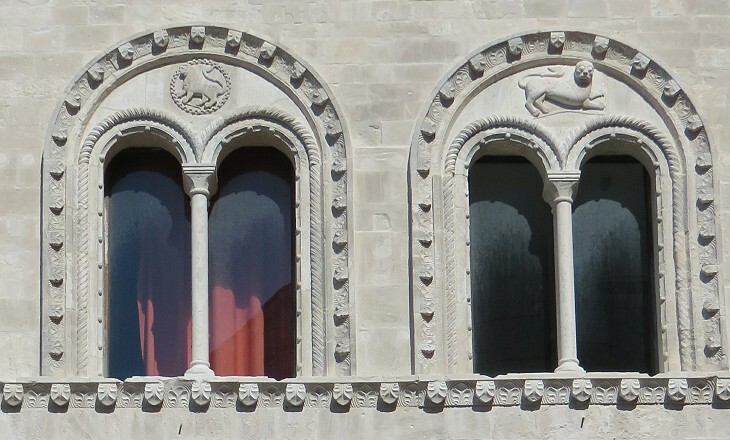 The palace is decorated with several small reliefs portraying a knight, the symbol of Ancona. At the beginning the town had a cross as symbol, but during the XIIIth century it started to mint coins portraying a knight, most likely a crusader knight. The new symbol was placed on many public buildings, including the weathervane of Palazzo degli Anziani shown in the icon of this section. The façade of the palace on the hill side was completely modified in the XVIIth century, but two of the XIIIth century reliefs which decorated it are still there. They are attributed to Margaritone d'Arezzo, who is best known for his paintings in Tuscany. 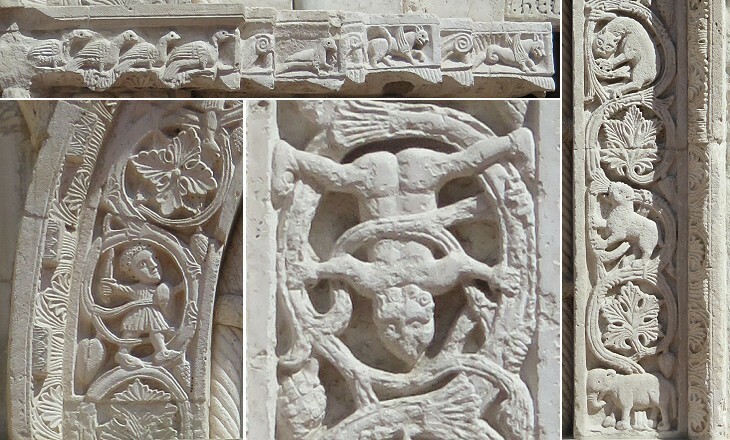 Considering that Lamech killing Cain is not a very frequent subject it is likely that Margaritone decorated the façade with many other reliefs. This small building of the XIIIth century (bombed during WWII) was the house of the officer in charge of police/customs at the harbour which was separated by walls from the town. 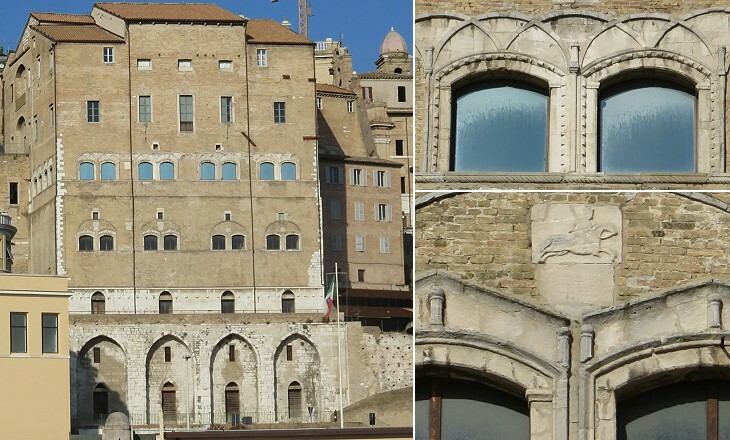 Its pointed arches are very similar to those of Palazzo degli Anziani. After the crisis of the XIVth century Ancona enjoyed a long period of prosperity which is covered in the following page.